Is medication the best way to relieve chronic pain? Most often, people who are suffering from chronic pain just want it to stop. But given the risks for drug dependency, abuse, and overdose from prescription medications, a number of doctors and researchers are refocusing their attention on alternative ways to help people experience relief. Daniel C. Cherkin, PhD, and a team at the Group Health Research Institute in Seattle, wanted to know if mindfulness-based stress reduction (MBSR) or cognitive behavioral therapy (CBT) could be as effective in relieving chronic back pain as traditional methods. They designed a randomized controlled study that included 342 participants, ranging in age from 20 -70 years, all of whom had experienced low back pain for at least 3 months. After completing baseline assessments of functional limitations and a self-reported back pain questionnaire, participants were randomized into the MBST, CBT, or usual care group. Participants in the MBSR and CBT groups participated in 2 hour group sessions, once per week over the course of 8 weeks. They received workbooks, audio CDs, and training on how to practice at home. Those in the MBSR group were also given the option of participating in a 6-hour retreat. Trained interviewers, who were blind to treatment groups, collected data 4 weeks after randomization (the mid-point of the study), at 8 weeks (post-treatment), and at 26 and 52 weeks. What they discovered could be helpful to so many patients. Although effects of MBSR and CBT were not evident before the end of the 8-week treatment period, researchers began to see statistically significant differences by the end of week 8. At 26 weeks, participants who had received MBSR or CBT training showed greater improvement in back pain and functional limitations as compared to those who received only their usual pain relief care. There were no statistical differences between the MBSR and CBT interventions. However, the improvement persisted at 52 weeks, with little change, for those in the MBSR group. This finding suggests that treatment strategies with a mindfulness component could provide clients with skills to help them manage pain over the long haul. beyond one year. I’d be interested to know how many continue to experience pain relief by implementing strategies from MBSR or CBT training. Also, participants in this study were all recruited from a single health care system, and all were highly educated, so it would be interesting to see it repeated with a sample drawn from a broader pool of candidates. But I’m always encouraged when I see medical professionals delving more deeply into the many health benefits of mindfulness training practices. If you’re interested in reading more about the study, you can find it in volume 315 of the Journal of the American Medical Association, number 12, pages 1240 – 1249. How about you? Have you ever tried, or recommended mindfulness to a client as a means of dealing with pain? How did it work out? Please tell us about it in the comments. Mindfulness has a 15% plus rate of serious psychiatric side effects and is not for everyone, I have chronic pain and with mindfulness all I get is a painful brain. Pain is the background noise in my brain. In chronic pain states the sufferer’s neuro transmitters have rewired to produce unnecessary pain signals. Imagine what it takes to completely rewire a neuro matrix which causes all the person’s neurotransmitters to fire all the time (abnormal and exhausting)? Many of us become so severe that medication AS WELL AS lifestyle techniques are crucial. Pain is a neurological illness even if kicked off by surgery or physical/ emotional trauma, it teaches us that there is no mind body split, the Central Nervous System cannot tell the difference between physical and emotional. The medics are finally realising this having damaged so many patients by applying an out dated medical model of mind- body split. Fantastic post on Chronic pain management guided meditation.Really appreciate your mention. Hi…I am 70 years…I have been having increasing pain…daily!! My legs are giving me much trouble..the best treatment for me has been med mj and chamomile tea…both together are very effective when used daily. But I cannot afford daily use of weed…but it has been very effective…good luck with yr medical practice…. Yes, it is the main component of a group I facilitate on wellness skills for pain management. Every week for 8 weeks, besides offering other pain management skills, I practice various mindfulness skills with the group. I have chronic pain from a car accident I was in. Mindfulness & meditation have changed my life. Although not pain free I am “handling” my pain differently and building new pathways every day. Clients with histories of chronic childhood abuse often have chronic pain that comes and goes, and is a mystery to doctors. Processing memories with EMDR, attending to physical pain as well as emotional can relieve pain associated with trauma. Mindfulnes and visualization with bi-lateral stimulation such as alternate tapping can also provide relief. CBT is useful as well. Hi Hazel, Thanks for your post. I have been suffering from chronic pain for a number of years and I come from a family of violence and abuse. I’m interested in what you said about it being a mystery to doctors because that’s just what it’s like for me. I have a condition called Burning Mouth Syndrome and there is nothing that can alleviate the pain, although meditation does certainly help me to manage it. What is alternate tapping? I wonder if Somatic Experience also could help with chronic pain? 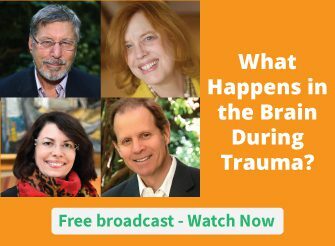 Yes, Somatic Experience can also help, especially with pain associated with old trauma. I was referred for CBT in 1998 by my pain management psychiatrist. I was off of work on short-term disability (due to a bad medication reaction) with fibromyalgia and chronic myofascial pain syndrome. I was afraid of not being able to pay bills at a percentage of my normal pay and so on and so forth, until it became “catastrophizing.” I don’t remember much about the actual CBT treatment process, but I did improve in a matter of weeks. I have been using EFT Tapping for over a decade to help people get relief from chronic pain. Because it helped me totally eradicate my chronic pain of 12 years when nothing else worked. I would be interested to know if Mindfulness and CBT both had long term effects, or whether CBT results just faded, as often happens with more conventional CBT. Also I would expect that Mindfulness, and any therapy ( including CBT ) would have better long term effects where they have an experiential component. My own view as a Focusing-Oriented psychotherapist, and that experiential techniques such as Mindfulness, Somatic Experiencing, and Gendlin’s Focusing, work very well independently of a CBT framework. When they are placed in a CBT framework they are the fuel that makes the CBT work for the longer time frame. CBT without an experiential dimension, will act as a form of suppression, so that they results will fade 6-9 months latter. Experiential types of therapy produce longer lasting change. I experience chronic ongoing pain, and I use a synthesis of Mindfulness and Gendlin;s Focusing-Oriented Psychotherapy. I find that this combination helps me deal with the effects of pain a better way. Just being with it keeping it company, makes it bearable. And if the pain terns out to be emotion based, then it focusing processes that pain. Unfortunately alot of my pain is not, it is physiological, and seems to be partly associated with newly discovered Thyroid problems. I recommend adapted Mindfulness skills to clients, as well as Focusing -Oriented and experiential therapy within the therapy room. Mindfulness definitely help patients with chronic pain. It makes a person better able to not shoot the second arrow and react to their pain. I am a physical therapist and also someone who lives with chronic neck and back pain. MBSR and my practice have helped transform me and this new way of thinking. Relaxing mind and body definitely helps with my own chronic pain. As a Feldenkrais practitioner, I am confident that 26 weeks of Feldenkrais functional integration sessions would do far more to relieve physical pain than MBSR or CBT training or mindfulness training. Although pain does have a psychological component, pain does have a physical cause. Amen!! Mindfulness has helped me with anxiety and panic attacks…..relaxation issues BUT not my actual pain from actual physical trauma from car accident 5 years ago (permanent physical and nerve damage). Now , I have read of Buddhist monks that have endured surgery without anesthesia via mediation/mindfulness……but we forget, the average person in our world has not had, nor do they have the luxury of practicing these modalities daily all day long for years on end! Most of us have to LIVE life, work and do other things just to exist so usually not realistic to think everyone can achieve this level. I am not close enough to Feldenkrais practitioner, nor do I have finances enough to receive the therapy, so I am doing Hanna Somatics via YouTube and beginning to see results! I also do Pilates as much as my pain and physical status will allow. These things , in my opinion, and based on pain improvement, have been the single most beneficial modalities I have accesses!! I still receive the most minimal pain pill dose one can receive pharmaceutically for assistance with pain management. Weather seems to make my pain worse. AND, even of I could use mindfulness/meditation to decrease it on these days or any day, would it still leave me time to actually live, work and play?? Or would my day consist of these techniques, so am I really gaining life quality or functionality?? Also, with all these studies, I wonder how many participants are people with chronic pain SEVERE enough to limit their daily functioning and to what level of limitation?? Seems much of this new trend (though promising and should’t be abandoned in hopes they can be fine tuned), is to push modalities that aren’t 100%proven for all the different depths/severity or roots of the pain issues. So I agree with you….some won’t just based on the fact that the latest trend is so popular and so hopeful, yet isn’t working for all as they want most to believe. I have lived with debilitating chronic pain for 10+ years, after having tried every Western therapeutic approach I stumbled into a mindfulness program 5 years ago. I am now an MBSR teacher (I was unable to work before), walking, breathing proof that meditation and mindfulness actually changes the brain and allows individuals to live a more wholesome life. Do I still have pain? Sure, but it’s my intention and approach to those sensations that has changed the way I live, and has allowed me to move from a drain on our healthcare system to a productive contributing member of society once again. I am an Advanced MELT instructor and I work with people who have chronic pain. The Melt Method, created by Sue Hitzman, is a simply yet highly effective way to get out of chronic pain. It also calms the stress reflex and has been very helpful with people who have PTSD and overall anxiety. I’d love for BESSEL Van Dee Kolk to try a class in his area. It’s not yoga, it’s a completely different treatment that works with the connective tissue, where billions of sensory nerves live and can cause stiffness and pain when it is dehydrated. The interesting thing about Melt is that as the body releases tension. Stories of Trauma are also often released. The mind/body connection is important to remember with pain. Nightline did a segment on the MELT Method. It is worth watching. I teach different forms of meditation once a week at our hospital (and been teaching for years), and in my classes I sometimes hear this, that the pain a patient had is now gone after the session. This is very interesting. I each various Imageries to eliminate the pain completely. I volunteer teach at a cancer clinic and find that with Emotional Freedom Techniques and Imagery, members can become pain free quickly and completely. I’ve been teaching there for 15 years now so have seen at least 100 members in all stages of cancer treatment. After Chemo many people are left with pain in their legs which the medical profession has never been able to attend to. With EFT and Imagery cancer people can dull that pain especially at night so they can sleep. And now that Dr. Doidge has told us why the Imagery works so effectively on pain its a pleasure to explain to members why it is working. Mindfulness is excellent for what it is good for but takes weeks to work. These cancer people can’t wait that long. They need pain relief now. Thanks for your post Crystal Hawk. I too routinely experience great results using Emotional Freedom Techniques with chronic pain. To support this work I integrate meditation and heart math techniques. So glad to hear about your work with people with cancer. Thank you! Hi Crystal. It is fantastic to hear of your success with EFT. I am new to the technique and finding it incredibly helpful at relieving anxiety, pain, insomnia, depression and so much more. I was excited to read that the technique is accepted at the cancer clinic. Keep on TAPPING in to health and healing. @ Crystal Hawk, your work sounds very interesting. Could you please share an article reference or webpage link that explains the EFT and Imagery protocol? I’ve had some training in EFT, but not combined with Imagery. Let me explain, you can release pain by closing your eyes, lying on the floor, and imagining you are a kitten/puppy, slowly and playfully extending your limbs, rolling over, enjoying the experience. Acknowledging that we belong to the animal kingdom, learning to let the ground support you by lying on the floor, is a useful concept. I hope this idea of visualising being a kitten/cat helps others. I’d be interested to know if just this focusing on being something other than a human being and combining it with “free movements” allows the brain to focus on healing? That’s so interesting,! In an effort to free myself from my draining constant thinking loops, I detached myself by imaging I was a fox curled up sleeping warm and safe, body breathing effortlessly. I felt that if I could focus on simply being a living animal rather than a human mind I would be released. This was some years ago and I have returned to the idea many times, especially since being taken over with chronic illness and associated mental and physical pain. I have practised CBT for some years but however much I rationalise my thinking I experience the same ‘gut’ feelings and the consequent adrenal responses. Mindfulness and acceptance works far more successfully for me personally. I should say here how grateful I am for all the generously freely shared resources available in this field – Tara Brach’s podcasts in particular have been very valuable to me. It is delightful to note that experts like you have started suggesting mindfulness for pain management. when I suggested one client to start minimum 10 sessions – 60 minutes / weekly to manage her chronic pain, she was surprised. Now she is free from pain. Every session, i personalized the practice and gave her an audio file to listen and practice. 10 session meant – 70 days. The Eastern wisdom says – regular practice with wisdom leads to results that seem unexpected. after 5 sessions , she started the practice 2 times at home. what i found that clients need personalized practices based on the changes and their experiences. not a single size fits all. Very interesting article and following on, the comments. I use an integration of mindfulness and resonance. The latter is best done on a mattress or something where the client can be horizontal. If that’s not possible, then find ways to adapt in order to enable the body to be not only supported, but free from constriction. Then a brief body scan followed by breath awareness. From here I encourage the client to voice the lowest note possible for them. With practise, the whole torso will resonate… A visualisation can be added in to this of expansion and release. I was a body-centered psychotherapist in private practice with clients who were all self-paying from 1988 until I retired in 2010. During that time I was using mindfulness and associated methods which pioneers in the field of psychotherapy, such as Al and Diane Pesso (PBSP) and Ron Kurtz (Hakomi), had been using since the early 1960’s and were highly influential in the methods of your presenters such as Pat Ogden and Bessel Van der Kolk. Mindfulness and the capacity to feel safe in observing and speaking ones’s inner processes is primary and essential component for effectively healing chronic physical and psychological pain. I am glad that the behavioral scientists have gotten beyond their theories of infant development that were actually creating trauma, e.g.Skinner Boxes, and are recognizing the essential importance of mindfulness. Clients need to realize what they are doing in their way of organizing their present ongoing experience in the frame of past experiences (often in subconscious memory) before they can begin to reorganize and change what they are doing and respond more effectively the present. i treat all my patients with chronic pain with mindfulness applied to postural awareness and very focused and subtle exercises that require daily mindfulness. These exercises are also done with a visulaisation appropriate to this particular person’s state of mind/belief system associated with their pain. The results are more efficient than just mindfulness exercises on their own. Sounds interesting. Do you have an example of such an exercise, Sylvia? Hi David and Sylviane, I have read your comments with great interest and pleasure. I include mindfulness in my therapeutic work with many of my clients and the resonance often was curiosity and improvement of situations. For my own personal wellbeing, I have enjoyed courses on mindfulness, especially a retreat in Ireland with Ron Siegel. I also use imagination exercises with Clients – is that what you mean by “visualization”, Sylviane?